Low-power photomicrograph of cardiac myxoma (hematoxylin and eosin stain). High-power photomicrograph showing the histology of cardiac myxoma (hematoxylin and eosin stain). Note the dark staining polygonal cells characteristic of the tumor. The clinical symptoms caused by cardiac tumors are generally secondary to their mass effect, local invasion, embolization, or constitutional symptoms. An intracardiac tumor mass may obstruct blood flow, compromise valve function, or induce neurological catastrophe secondary to tumor embolization. The location of the tumor determines the type of symptoms produced, which can include syncope, angina, dyspnea, edema, ascites, depression of pump function, cardiomyopathy, and pulmonary hypertension. Some tumors produce no symptoms and are found incidentally as a consequence of secondary symptoms such as stroke or evidence of peripheral embolization. Several types of tumors can arise in the heart, depending upon the tissues and structures involved. Primary neoplasms may arise from endocardium, valvular structures, primitive tissue rests, and the conduction system. Secondary or metastatic neoplasms arise from hematologic spread of the originating tissue. The physiologic derangements induced by the tumor are dependent upon the location of the mass and the tissue from which it arises. Incidence depends upon tumor cell type. Overall incidence of the disease is 0.0001-0.5% in autopsy series. Myxomas account for 40-50% of primary cardiac tumors in patients aged 30-60 years. Rates of cardiac tumors in other countries parallel rates in the United States. Myxomas: The mortality rate of patients after myxoma removal does not differ significantly from that of the general population. Rhabdomyoma, fibroma, fibroelastoma, hemangioma, lipoma, teratoma, and hamartoma: These are benign tumors, and mortality rates in patients with these tumors do not differ significantly from that of the general population. Malignant tumors: These tumors are generally sarcomatous in nature. In spite of resections (complete or incomplete), median survival duration ranges from 10-24 months. Primary cardiac tumors appear to occur equally in all races, unless their presence is connected directly with underlying genetic disorders that demonstrate a race predilection. The frequencies of these tumors in males and females are the same. Cardiac myxoma, lipomatous septal hypertrophy,  paraganglioma, and sarcoma tumors occur primarily in adults. Papillary fibroelastoma,  hemangioma, and lipoma occur in all age groups. Attar S, Lee YC, Singleton R, et al. Cardiac myxoma. Ann Thorac Surg. 1980 May. 29(5):397-405. [Medline]. Burke AP, Cowan D, Virmani R. Primary sarcomas of the heart. Cancer. 1992 Jan 15. 69(2):387-95. [Medline]. Butany J, Nair V, Naseemuddin A, et al. Cardiac tumours: diagnosis and management. Lancet Oncol. 2005 Apr. 6(4):219-28. [Medline]. O'Neil MB Jr, Grehl TM, Hurley EJ. Cardial myxomas: a clinical diagnostic challenge. Am J Surg. 1979 Jul. 138(1):68-76. [Medline]. Cresti A, Chiavarelli M, Glauber M, Tanganelli P, Scalese M, Cesareo F, et al. Incidence rate of primary cardiac tumors: a 14-year population study. J Cardiovasc Med (Hagerstown). 2016 Jan. 17 (1):37-43. [Medline]. Llombart-Cussac A, Pivot X, Contesso G, et al. Adjuvant chemotherapy for primary cardiac sarcomas: the IGR experience. Br J Cancer. 1998 Dec. 78(12):1624-8. [Medline]. Basu S, Folliguet T, Anselmo M, et al. Lipomatous hypertrophy of the interatrial septum. Cardiovasc Surg. 1994 Apr. 2(2):229-31. [Medline]. Smythe JF, Dyck JD, Smallhorn JF, et al. Natural history of cardiac rhabdomyoma in infancy and childhood. Am J Cardiol. 1990 Nov 15. 66(17):1247-9. [Medline]. Shahian DM, Labib SB, Chang G. Cardiac papillary fibroelastoma. Ann Thorac Surg. 1995 Feb. 59(2):538-41. [Medline]. Burke AP, Virmani R. Cardiac rhabdomyoma: a clinicopathologic study. Mod Pathol. 1991 Jan. 4(1):70-4. [Medline]. Burke AP, Rosado-de-Christenson M, Templeton PA, et al. Cardiac fibroma: clinicopathologic correlates and surgical treatment. J Thorac Cardiovasc Surg. 1994 Nov. 108(5):862-70. [Medline]. Brizard C, Latremouille C, Jebara VA, et al. Cardiac hemangiomas. Ann Thorac Surg. 1993 Aug. 56(2):390-4. [Medline]. Garson A, Smith RT Jr, Moak JP, et al. Incessant ventricular tachycardia in infants: myocardial hamartomas and surgical cure. J Am Coll Cardiol. 1987 Sep. 10(3):619-26. [Medline]. Jebara VA, Uva MS, Farge A, et al. 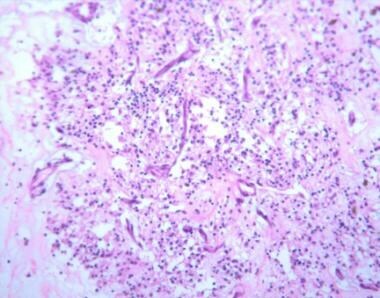 Cardiac pheochromocytomas. Ann Thorac Surg. 1992 Feb. 53(2):356-61. [Medline]. Lund JT, Ehman RL, Julsrud PR, et al. Cardiac masses: assessment by MR imaging. AJR Am J Roentgenol. 1989 Mar. 152(3):469-73. [Medline]. Sparrow PJ, Kurian JB, Jones TR, et al. MR imaging of cardiac tumors. Radiographics. 2005 Sep-Oct. 25(5):1255-76. [Medline]. Reeder GS, Khandheria BK, Seward JB, et al. Transesophageal echocardiography and cardiac masses. Mayo Clin Proc. 1991 Nov. 66(11):1101-9. [Medline]. Nomoto N, Tani T, Konda T, Kim K, Kitai T, Ota M, et al. Primary and metastatic cardiac tumors: echocardiographic diagnosis, treatment and prognosis in a 15-years single center study. J Cardiothorac Surg. 2017 Nov 28. 12 (1):103. [Medline]. [Full Text]. Read RC, White HJ, Murphy ML, et al. The malignant potentiality of left atrial myxoma. J Thorac Cardiovasc Surg. 1974 Dec. 68(6):857-68. [Medline]. Ferrans VJ, Roberts WC. Structural features of cardiac myxomas. Histology, histochemistry, and electron microscopy. Hum Pathol. 1973 Mar. 4(1):111-46. [Medline]. Murphy MC, Sweeney MS, Putnam JB Jr, et al. Surgical treatment of cardiac tumors: a 25-year experience. Ann Thorac Surg. 1990 Apr. 49(4):612-7; discussion 617-8. [Medline]. Ramlawi B, Leja MJ, Abu Saleh WK, Al Jabbari O, Benjamin R, Ravi V, et al. Surgical Treatment of Primary Cardiac Sarcomas: Review of a Single-Institution Experience. Ann Thorac Surg. 2016 Feb. 101 (2):698-702. [Medline]. Lee KS, Kim GS, Jung Y, Jeong IS, Na KJ, Oh BS, et al. Surgical resection of cardiac myxoma-a 30-year single institutional experience. J Cardiothorac Surg. 2017 Mar 27. 12 (1):18. [Medline]. [Full Text]. Michler RE, Goldstein DJ. Treatment of cardiac tumors by orthotopic cardiac transplantation. Semin Oncol. 1997 Oct. 24(5):534-9. [Medline]. Shah IK, Dearani JA, Daly RC, Suri RM, Park SJ, Joyce LD, et al. Cardiac Myxomas: A 50-Year Experience With Resection and Analysis of Risk Factors for Recurrence. Ann Thorac Surg. 2015 Aug. 100 (2):495-500. [Medline]. Basso C, Valente M, Poletti A, et al. Surgical pathology of primary cardiac and pericardial tumors. Eur J Cardiothorac Surg. 1997 Nov. 12(5):730-7; discussion 737-8. [Medline]. Thomason R, Schlegel W, Lucca M, et al. Primary malignant mesothelioma of the pericardium. Case report and literature review. Tex Heart Inst J. 1994. 21(2):170-4. [Medline]. Balasundaram S, Halees SA, Duran C. Mesothelioma of the atrioventricular node: first successful follow-up after excision. Eur Heart J. 1992 May. 13(5):718-9. [Medline]. Abdou M, Hayek S, Williams BR 3rd. Atrial myxoma in a patient with hypertrophic cardiomyopathy. Tex Heart Inst J. 2013. 40(4):462-4. [Medline]. [Full Text]. Bhan A, Mehrotra R, Choudhary SK, et al. Surgical experience with intracardiac myxomas: long-term follow-up. Ann Thorac Surg. 1998 Sep. 66(3):810-3. [Medline]. Butany J, Leong SW, Carmichael K, et al. A 30-year analysis of cardiac neoplasms at autopsy. Can J Cardiol. 2005 Jun. 21(8):675-80. [Medline]. Jain D, Maleszewski JJ, Halushka MK. Benign cardiac tumors and tumorlike conditions. Ann Diagn Pathol. 2010 Jun. 14(3):215-30. [Medline]. Jelic J, Milicic D, Alfirevic I, et al. Cardiac myxoma: diagnostic approach, surgical treatment and follow-up. A twenty years experience. J Cardiovasc Surg (Torino). 1996 Dec. 37(6 Suppl 1):113-7. [Medline]. La Francesca S, Gregoric ID, Cohn WE, et al. Successful resection of a primary left ventricular schwannoma. Ann Thorac Surg. 2007 May. 83(5):1881-2. [Medline]. Matebele MP, Peters P, Mundy J, Shah P. Cardiac tumors in adults: surgical management and follow-up of 19 patients in an Australian tertiary hospital. Interact Cardiovasc Thorac Surg. 2010 Jun. 10(6):892-5. [Medline]. McAllister HA Jr. Primary tumors and cysts of the heart and pericardium. Curr Probl Cardiol. 1979 May. 4(2):1-51. [Medline]. Muzzi L, Davoli G, Specchia L, et al. Primary hemangioma of the mitral valve: an unusual presentation. J Heart Valve Dis. 2007 Mar. 16(2):209-11. [Medline]. Nonami A, Takenaka K, Kamezaki K, et al. Successful treatment of primary cardiac lymphoma by rituximab-CHOP and high-dose chemotherapy with autologous peripheral blood stem cell transplantation. Int J Hematol. 2007 Apr. 85(3):264-6. [Medline]. Padalino MA, Basso C, Milanesi O, et al. Surgically treated primary cardiac tumors in early infancy and childhood. J Thorac Cardiovasc Surg. 2005 Jun. 129(6):1358-63. [Medline]. Park KJ, Woo JS, Park JY. Left atrial myxoma presenting with unusual cystic form. Korean J Thorac Cardiovasc Surg. 2013 Oct. 46(5):362-4. [Medline]. [Full Text]. Paul S, Ramanathan T, Cohen DM, et al. Primary Ewing sarcoma invading the heart: resection and reconstruction. J Thorac Cardiovasc Surg. 2007 Jun. 133(6):1667-9. [Medline]. Peregud-Pogorzelska M, Kazmierczak J, Wojtarowicz A. Intracavitary mass as the initial manifestation of primary pericardial mesothelioma: a case report. Angiology. 2007 Apr-May. 58(2):255-8. [Medline]. Tatli S, Lipton MJ. CT for intracardiac thrombi and tumors. Int J Cardiovasc Imaging. 2005 Feb. 21(1):115-31. [Medline]. Wei K, Guo HW, Fan SY, Sun XG, Hu SS. 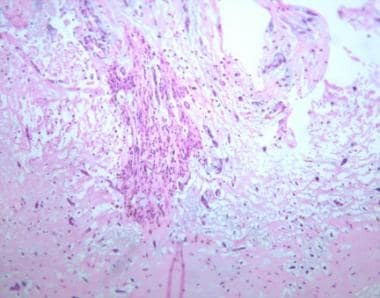 Clinical features and surgical results of cardiac myxoma in Carney complex. J Card Surg. 2019 Jan. 34 (1):14-19. [Medline].